Last Tuesday was the day of Sankranti. A festival that is widely celebrated in India, but in different ways and by different names. Many across the country fly colorful kites on this day to celebrate this festival. Sankranti is associated with the end of the harvesting season, so to get a real feel of this festival you need to venture out of the cities and into the villages and small towns. 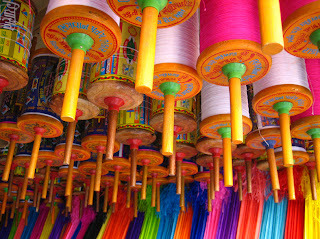 Note: Picture of reels of kites and kite-strings by Indian. 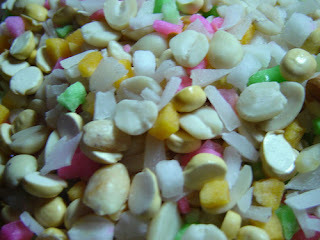 In Mysore, I remember my local friends distributing a sweet-dish, yellu - a mix made with sesame seeds, coconuts, sugar blocks. A common custom found across Karnataka is the exchange of sugarcane pieces and yellu with one's neighbors, friends and relatives. You can see cows and and bullocks gaily decorated during this day. They are fed Pongal - a sweet preparation of rice and special prayers are offered as a part of the celebrations of the harvesting season. In the evening, the cattle are led out in procession to the beat of drums and music. At night a bonfire is lit and the animals are made to jump over the fire. In Uttar Pradesh, people eat only vegetarian food on this day, especially khichdi (rice cooked together with black lentils). Taking a dip in the holy rivers on this day is regarded as most auspicious. A big one-month long fair called Magha Mela begins in Allahabad. Ritual bathing also takes place at other Hindu holy places such as Haridvar and Garh Mukteshwar. Tamil Nadu calls this festival Pongal, as does some other states in South India. Pongal takes its name from the surging of rice boiled in a pot of milk, and this festival has more significance than even Diwali and signifies the beginning of the New Year. Rice and pulses cooked together in ghee and milk is offered to the family deity after the ritual worship. In Punjab where this is usually the coldest time of the year, huge bonfires are lit on the eve of Sankranti. This festival is popularly called Lodi there. Sweets, sugarcane and rice are thrown in the bonfires, around which friends and relatives gather together. The Punjabis dance their famous Bhangra dance before sitting down to feast on a variety of food specially prepared for the occasion. Like is common with many Hindu festivals, there are multiple mythological stories connected to Sankranti. Bhishma, one of the key characters of the Mahabharata, is also supposed to have died on this day. Thanks so much for sharing - you know I love to read about other cultures and traditions as much as I like to share about Norway's. Its also interesting to read that the tradition is celebrating differently from districts to district and I guess that shows that the country is really big. Isn't it interesting that the same day is celebrated in different ways for different reasons in different parts of the country! But I missed any mention of Rajasthan and Gujarat, where Sankranti is the most important festival - I don't think that the excitement of kite flying in any city of India is greater than that in Jaipur or Ahemdabad. Having spent my childhood in Jaipur, I miss dearly the colors and the festivity of its Sankranti. When I think of India, I think of colors. I love the top picture... exactly how I picture the country. I'd love to go celebrate something over there, I bet it's so much fun! In Punjab, there's also Baisakhi (or Vaisakhi) which also is another harvest festival. Is it also celebrated at the same time? Threw me for a loop with this one. Lodi is the town I grew up in.. thought you had visited... then you can appreciate in the John Fogarty song "Stuck In Lodi Again"... which BTW pretty much describes the place well. Stuck being the operative word. @rennyba: India is big, but there are larger countries. However, it is certainly one of the most diverse. @zhu: India certainly is colorful, in many ways! @indicaspecies: Vaisakhi is another popular festival in Punjab and celebrates the beginning of a new harvesting season. Vaisakhi comes in the month of April. i think this is the best part of indian festivals..they are celebrated in the same spirit though in different names..
@backpakker: Absolutely! Every time I have moved to a different state in India, there are all the subtle differences I notice even in things that are common to all of India.